On that end, the USDA's Food Safety Inspection Service (FSIS) and the Food and Drug Administration (FDA) have agreed to cooperate in the joint oversight of lab meats. Per the agreement, which was released on March 7, 2019, the FDA will conduct premarket consultations and oversee the initial cell collection and all "pre-harvest activities." Meanwhile, USDA will oversee the inspection of all facilities that harvest, process, package or label cell-cultured proteins derived from the cells of livestock and poultry. All product labels will also be subject to USDA's pre-approval and verification process and would receive the same familiar purple inspection stamp typically reserved for traditionally-raised meat products. Kenny Graner, United States Cattlemen's Association (USCA), expressed concerns about the regulatory framework of this joint agreement. "We are encouraged by USDA and FDA preemptively formalizing a joint regulatory framework prior to the commercialization of these products," said Kenny Graner, United States Cattlemen's Association (USCA) president, "Further, we're pleased with language in the formal agreement that will allow USDA FSIS pre-market labeling authority." The National Cattlemen's Beef Association (NCBA) has also expressed concerns with the products themselves as they get closer to entering the marketplace. "Fetal Bovine Serum, or blood drawn from a calf fetus, is the most popular means of cell collection," says USCA. "The calf fetus is removed during eveisceration and blood is extracted via cardiac puncture without anesthesia." With so much uncertainty about these products, several states have taken legislative action to ensure the integrity of traditionally-raised meat products and to provide transparency in food labels. Brad Jones for Futurism writes, "China has signed a trade agreement with Israel worth $300 million that will see the country import lab-grown meats produced by three companies: SuperMeat, Future Meat Technologies, and Meat the Future. This move is part of China's ongoing effort to address its most pressing environmental problems. Last year, the Chinese government announced plans to encourage citizens to eat less meat, in an effort to reduce the country's consumption by 50 percent. As it stands, around $13.5 billion worth of meat is imported into the country every year." Burger King joins White Castle in serving the Impossible Burger. Meanwhile, TGIFridays serves the Beyond Burger, and an online petition with 63,000+ signatures is urging McDonald's to bring vegan burgers to its 14,000 U.S. locations. Certainly, the plant-based trend appears to be moving forward full-steam ahead; however, despite its promises to be more ethical, humane, environmentally-friendly and the perfect substitute to beef, the Impossible Burger is not as perfect as claimed. According to Eater, "Although the FDA has not mandated the recall for any food safety reason, Impossible Foods has ordered the recovery of the lot produced on Feb. 19, 2019 'out of an abundance of caution,' according to a spokesperson. 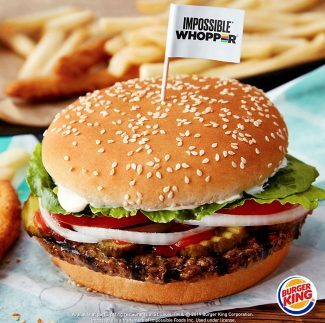 It's the first time the company behind the 'bleeding' Impossible Burger has issued a recall of its restaurant-quality fake meat." Bad press aside, "U.S. sales of plant-based meats jumped 42% between March 2016 and March 2019 to a total of $888 million," reports ABC News. "Traditional meat sales rose 1% to $85 billion in that same time frame."